Winter in Central Indiana can sometimes be pretty miserable. But we have gotten really good at making our indoor spaces mimic fun in the sun all through the cold winter months! Hendricks County not only boasts 28 hotels, vacation rentals and bed and breakfasts, but a whopping 15, including the Embassy Suites Hotel & Conference Center that will open in the first quarter of 2019, offer awesome indoor pools! 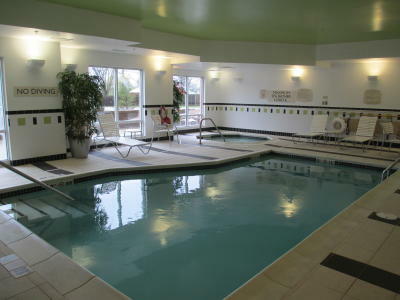 So, I&apos;ve put together a list of my five favorite hotels with indoor pools along with a complete list of every Hendricks County hotel with an indoor pool. If you’re coming to visit us in Hendricks County, check out these hotels so your family can have some fun in the pool as you enjoy our destination. The first thing that jumped out at me with this pool was the handicap access. There is a lift on the side of the pool for those who need assistance. I love the inclusion this encourages. 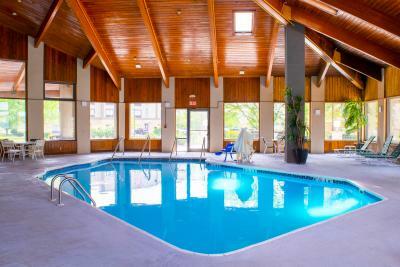 Any and all families can stay here comfortably and have fun in the process. There’s also a hot tub for those simply wanting to unwind and relax. While most hotel pools are roughly the same, I love hotels that add a little style. The bright colors and greenery that surround this pool definitely give it a beach feel! Who doesn’t love that in the dead of winter? This hotel just celebrated a grand reopening after major renovations both inside and out including refreshing its pool area, which really shows. There are lounge chairs as well as tables and chairs to allow for waterfront relaxation. Beat the chill and gray of an Indiana winter and enjoy some time with your family in this beach-esque pool. This pool is surrounded by greenery and lounge chairs. A low step lines the wide entrance of the pool, a perfect spot to perch while your kids go nuts. Float in the warm water of this indoor pool or join your adult friends in the jacuzzi to wind down after a day of celebrating the holidays with family. This pool is by far one of my favorites. The high, vaulted ceilings with exposed beams makes this pool feel like its tucked away in a mountain cabin. 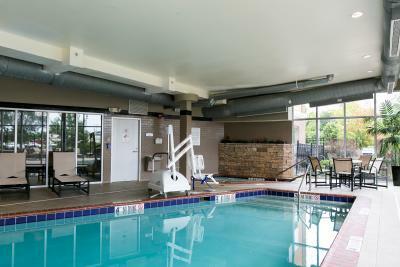 The cozy feel of this pool area will only add to your relaxation and warmth as you let the kids get all their energy out from a long car ride or if you just want to wind down with your special someone. This pool also has some added style. As seen in the featured photo at the top of this story, window planters, floor to ceiling windows, and a fountain make this pool feel more like a Roman bath. When you’re coming our way this winter, consider the pools our hotels have to offer. Add a little extra something to your stay by making sure your family is making memories, even in your downtime.